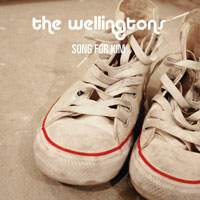 The Wellingtons are everything that's fun, smart and sweet about indie guitar pop – sunshine hooks, big choruses and girl-boy harmonies. Add 10 infectious, feel-good tunes with a shiny dollop of punchy pop on the top and you have their new album Heading North For The Winter. For those who love tight, riffy guitars and retro-style saccharine harmonies, Heading North For The Winter delivers fresh sing-along tunes that reel you in and leave you wanting more. 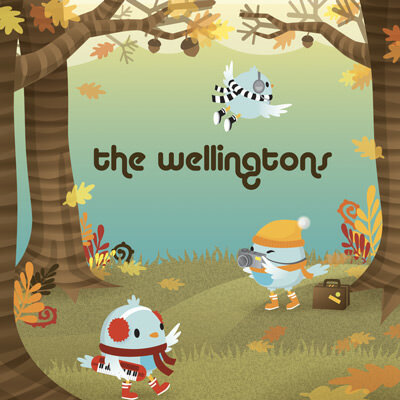 Sounding like a youthful Weezer, five-piece The Wellingtons unashamedly wear their American-pop influences on their effortlessly charming sleeves. With Stateside sounds mixing it up with twee-pop sensibilities, it’s no surprise their tunes have been lapped up in the USA, with a Wellingtons track featuring in the hit US TV series How I Met Your Mother. Aiming to perfect the (almost) two-minute pop song, the double A-side numbered limited-edition 7”-vinyl first single features the effervescent Freak Out and the sparkling Song For Kim – a stomping slice of guitar-driven glee written as a fan dedication to Kim Shattuck, lead singer of mid-90s SubPop band The Muffs. "I’ve been an enormous fan of The Muffs for a long time," says lead singer Zac, "and while on tour in America last year, we actually got to support them at a festival. We met Kim and chatted, and when I wrote Freak Out, I asked her to sing backing vocals on the track and she agreed!" So with one side dedicated to indie fandom and the other featuring the very same object of desire, it’s an odd, but irresistible, twist of fate. Come Undone is a piece of pop magic with its 60s beats and harmonies overlaid with big guitars and skewed synth sounds. I Get My Heart Broken Every Day opens with swelling brass and toe-tapping swagger, revealing a banquet of sonic fun where The Wellingtons (like all the greats) muse about lost love. The album then gallops through at a cracking pace with Popped Balloon and Natalie revealing a rockier element, while For Friends In Far Away Places and Waiting For My Time To Come show the more wistful side of The Wellingtons. I Want To Go Back and On & Off end the album on a high with run-to-the-finish line joie de vivre. Clocking in at just under 30 minutes, Heading North For The Winter is everything a great pop record should be – short, sweet and to the undeniably catchy pop point. Exclusive to the physical CD are four bonus tracks, one of which (in keeping with their guitar-pop roots) is a soaring cover of "Conversations", a Posies classic.